Bogani Nani National Park which was originally named Wartabone Tomini Bone National Park designated as a national park by the Minister of Forestry in 1990 with broad ± 287 115 hectares. Administratively, the government is in between Bolaang Mongondow and Gorontalo District. To reach the location: Manado - Kotamobagu (185 km) over 4 hours. From Kotamobagu to Toraout (69 km) within 1 hour or from Kotamobagu to Maelang (100 km) within 3 hours. Topography National Park Bogani Nani Wartabone range from flat, corrugated mild to severe and steep hilly with elevation ranging from 50-1970 m above sea level. The highest peak is G. sinombayuga North-South divide which also divides the watershed area of ​​Bone and Tomini. In general, the rainfall in the valley Tomini average of 1700-2200 mm / year. The air temperature ranged from 21.5 ° - 31 ° C, best visit in April to September. The area consists of moss forest, low mountain rain forest, lowland rain forest and secondary forest. Flora is the dominant species include Piper adundum Ficus, Trema orientalis, Macaranga sp, yellow wood (Arcangelisia flava), palm matayangan (Pholidocarpus ihur), chrysolite, ylang, agathis, ebony, iron wood and others. This Park has a diversity of fauna Nani Wartabone derived from Oriental and Australasian region with a high level endemic. The birds are varied around 125 species including pigeons, hooked beak, rajaudang, butterflies, hornbills, bee-eaters, and a special kind of bird that is Maleo (Megacephalon maleo). In addition, there are animals that include a large dwarf buffalo, hog deer, tarsier, possum and many kinds of reptiles. Recreation and nature tourism attractions such as wildlife Maleo, waterfalls, hot springs, cross the forest, observing wildlife, archeological sites and others. Facilities available: Office, guest house, laboratory, researchers homeless, street trail, cottage work, guardhouse, camping ground, research stations, shelters and others. National Park Bogani Nani Wartabone known as "Wallacea Area"
There has been no exploitation of nature tourism. National Park Bogani Nani Wartabone formerly known Tomini Bone, has a variety of ecological uniqueness as a transitional area Indomalaya geographical zone in the west and Papua-Australia in the east (Wallaceae Area). Unique and rare plants in the Park Bogani Nani Wartabone namely palm matayangan (Pholidocarpus ihur), ebony (Diospyros celebica), ironwood (Intsia spp. ), Yellow wood (Arcangelisia flava) and the corpse flower (Amorphophallus companulatus). While the common plants such as Piper aduncum, Trema orientalis, Macaranga sp., Chrysolite, agathis, ylang, and various species of orchids and ornamental plants. National Park Wartabone Bogani Nani has 24 species of mammals, 125 species of bird, 11 species of reptiles, 2 species of amphibian, 38 species of butterflies, 200 species of beetles, and 19 species of fish. Most of the animals living in national parks is an endemic species of Sulawesi island like a black monkey / crested black macaques (Macaca nigra nigra), monkeys Tomini bone (M. nigrescens), Tangkasi (Tarsius spectrum spectrum), Sulawesi civet (Macrogalidia musschenbroekii musschenbroekii) anoa large (Bubalus depressicornis), small anoa (B. quarlesi), babirusa (Babyrousa celebensis), and various species of birds. The mascot bird wildlife park is maleo (Macrocephalon maleo), and bone kelelewar (Bonea bidens) is a species endemic to the park. Maleo body size is similar to chicken, but the eggs 6 times the weight of chicken eggs. 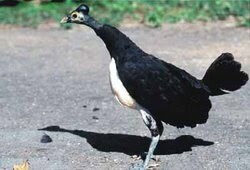 Maleo laying their eggs in the soil / sand 30-40 cm, and is usually located adjacent to the hot springs. With this geothermal maleo eggs hatch. The exit of the child maleo from the ground, running children maleo to the wild (day old), peek mother digging holes, are one of the interesting wildlife attractions for tourists. Kosinggolan. Camping, climbing to Mount Poniki, animal / plant observation. Toraut by car, Lombongo, Tambun. Lakes, waterfalls Sweepstakes, hot springs, camping, mountain climbing Padang, cross the forest, swimming, attractions and cultural heritage maleo (stone-room). Matayangan. Maleo, black monkeys, hornbills and other bathing in the river other. The event culture outside the Park include Bolaang Mongondow Festival in March and Gorontalo Festival in May. The best visiting season: April to September each year.